As fall approaches and the rains begin to bring the parched landscape back to life, wild greens gradually begin to appear in the markets of Bodrum. 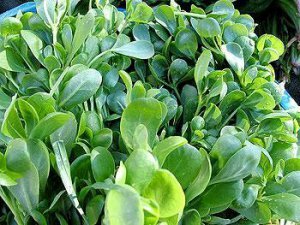 It takes a bit of knowledge to fully perceive the variety of greens, because the piles of greens on the tables, which seem fairly uniform at first glance, actually contain many different herbs. Collected by village women from gardens, fields, plains and mountains, they are priced according to their availability and where they were collected. For example, the hardal otu (wild mustard) collected from around the base of trees in the mandarin orange orchards come cheap. As nettles and mallow are available almost year-round and come up in orchards and gardens everywhere, they are inexpensive as well. But others such as kenker, tilkişen and acıot are always expensive. Just as fruits and vegetables have their seasons, wild greens are season as well. Some come up in summer while others are only found in January. In spring, when you may be growing tired of seeing some of them, others are just coming into season. For example, in one market I visited in November, I noted the following wild greens: fennel, black lovage, black nightshade, shepherd’s purse, samphire, mallow, poppy greens, mustard, wild chicory, nettle, black mustard, goosefoot, wild garlic and radish. Of these, the black lovage, wild garlic and poppy normally show up later in Bodrum markets, but a seller who was a cotton farmer had harvested these from his fields and brought them in, contributing to the variety of greens present. Just as these greens differ in their appearance and form, they also have different flavors and uses. Because of its sharp, anise-like flavor, I’m not wild about arapsaçı (wild fennel), but because it goes very well with blackeyed peas, I make sure to buy it at least once a year. I made this dish for the first time after being inspired by the Bodrum dish, navy beans with fennel. 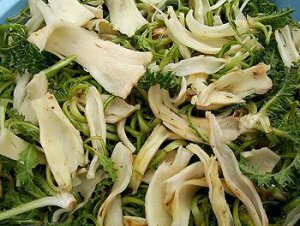 Fennel is also sautéed and eaten with yogurt. Perhaps the favorite way of preparing it is as fennel with lamb, a dish brought by the Cretan refugees in the early 20s. Dağ marulu (shepherd’s purse) is known as kuş ekmeği in Istanbul and its surroundings. In Bodrum it is added to sautés as well as eaten raw when very young and tender. 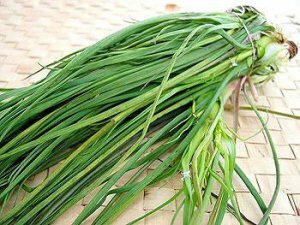 Another very popular herb, köremen or wild garlic, is added to sautés, böreks, breads and other dishes, any way as fresh green garlic might be used. Its appearance is so close to that of domestic garlic that it is difficult to distinguish the two. 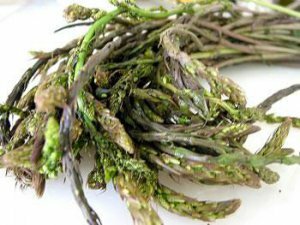 The real season for deniz börülcesi or samphire is spring; although it is available in the autumn, the most tender shoots are available in spring and summer, and I attribute its appearance in November in Bodrum to lack of knowledge among the venders. It is interesting that while samphire is very popular along the strip of coast from Ayvalık to İzmir, in Bodrum there were people who didn’t know what was three or four years ago. When I asked the vendors what to do with it, how to cook it, they didn’t know. At that time it was sold at only a few tables in the market. They had seen someone collecting it, and collected it themselves from the seasides to make some money. But in Ayvalık, eyes shine at the mention of samphire, and they can give you a host of recipes for it. Samphire is boiled whole and drained. Then the central hard stringy part is pulled out, and it is served with a yogurt sauce, or with olive oil, lemon and garlic. 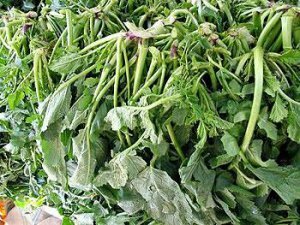 Gelincik (poppy), hindiba (wild chicory), ısırgan (nettle), turp (wild radish) and hardal (wild mustard) are well known to anyone who has even the least interest in wild greens. Nettles and wild chicory in particular grow in many areas in Turkey and are quite popular. Thought wild radish and mustard are best known in the Aegean and Mediterranean regions, they have also come into use in other areas. 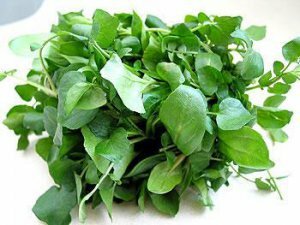 The most common use of chicory, radish and mustard greens is to boil or steam them and serve them with olive oil, lemon and salt. In addition, some women in Bodrum boil wild radish greens and make them into a sort of frittata. Like shepherd’s purse, wild chicory can also be eaten raw when young and tender. Wild poppies dazzle the eye along roadsides in January and February, but before they send up their flower buds, the greens, gathered into bundles, are a common sight in the markets. You will come across their lightly hairy leaves in mixed green böreks. Although their flavor does not stand out especially, they are tasty when cooked. Cooked like spinach, poppy greens go very well with legumes, and can be added to böreks and cooked into frittatas. Next comes kazayağı (sicle weed, goosefoot). Known in many areas of Turkey by the same name, with its fragrant aroma it is a much loved herb. 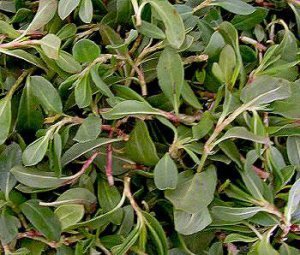 It is generally sautéed, either on its own or mixed with other greens, and is one of the herbs that is sure to be found in piles in the Bodrum market, perhaps because it is common and easy to gather. It generally likes the bases of trees, the shade of pines, and meadows, you just need to recognize it. It can be added to mixed greens for böreks; it’s one of those herbs that goes with everything. Bambul, or black nightshade, is a summer herb, found from the beginning of summer until fall. Black nightshade has very pretty white flowers, and as with many other wild greens, it is eaten before its blooming season. As the people of Bodrum identify this plant with immigrants from Crete, they call it Girit otu, or “Cretan herb.” The Cretan people themselves call it “Stifno” (or “İstifno”). In Ayvalık, where there are many Cretan immigrants as well, they cut it up with Cretan squash and serve it as a salad. In Bodrum, the tender tips of black nightshade are simmered, then served as a salad with olive oil and lemon. Baldiran (black lovage) has suffered more from its name than anything else, for in Turkish the same word is used for the famous poison hemlock that killed Socrates. Those who confuse the two immediately say “that’s poisonous.” It’s interesting actually that a plant that is sold in such large quantities in Bodrum should be so little used elsewhere. 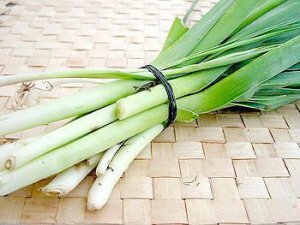 When it first appears in the markets in autumn, it is reminiscent of celery stalks. Its green stalks and parsley-like leaves are added to sautés and combinations of greens for börek. When black lovage matures, its stems grow thick, and take on a pinkish cast. When it reaches this stage, only its stems are offered for sale. You can steam or boil these stems for a very nice salad. An old woman from Gümüşlük village named Münevver said that when boiled, then rolled in flour and fried, its taste was “like fried fish.” Although I haven’t tried it, I’m sure it’s quite good. The high season for wild greens in Bodrum is from February to March. 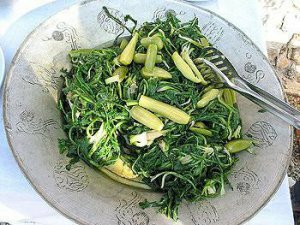 In March, kenker (Illyrian thistle), wild garlic, sorrel, dock, and the wild asparagus and black bryony so loved in Bodrum have made their appearance; when you go to the market you hardly see the other vegetables and give in to the wealth of wild greens. You think “I’ll make boiled salad, I’ll sauté them, I’ll make börek,” and go home loaded down with wild greens. You can’t help but buy some nettle-and-olive bazlama (a type of thin bread filled with greens and cooked on a griddle) from Elif, you shoot the breeze with her, and the next day you have that extraordinary bazlama with your breakfast. The following is a list of herbs that were on sale in the Bodrum bazaar on February 11, 2000: Fennel, black lovage (both with green leaves and with pink stems), shepherd’s purse, mallow, dog’s cabbage, mustard, wild chicory, Illyrian thistle, yellow thistle, sicle weed, wild garlic, cranesbill, wild asparagus, wild radish, black bryony, wild chrysanthemum, sorrel and dock. You may notice that many of the herbs that were present in November are still available, but as I noted above, by mid-February other herbs have now come onto the market, adding to the variety. The most pricey of these are of course the wild asparagus, bryony and Illyrian thistle. Lots of tilkişen. This word usually refers to the thin shoots of wild asparagus. When it first comes into season especially it is expensive but people here love it so much that they are willing to pay the price. Because it is so time-consuming to collect, the vendors do not like to bargain for it, and refuse to lower their prices. 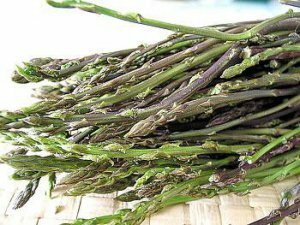 You’ll find yourself looking for ways to extend the one or two handfuls of wild asparagus you buy. My way is to sauté it together with potatoes, onion and garlic. The people of Bodrum sauté it in a generous amount of olive oil and then add eggs, as a kind of frittata. It has a cousin, acıot or black bryony, which grows in the same environments as wild asparagus, and is sometimes offered mixed together with it in bunches. When it is like this, you are obliged to cook them together. It must be for this reason that in some areas, the names are reversed. One of my favorites, keçi körmeni, a type of wild garlic, is now on the market. I used to buy it nearly every week at the market, but when I learned to identify it, I proudly went out and collected my own. In this way I wasn’t forced to find ways to finish the great bunches that were offered in the markets, and just gathered as much as I needed at the moment. Thanks to Naime Teyze, who taught me where to find it, I still remember and miss her, her daughter Maynur, the things they taught me and the gifts they gave me. Wild garlic can be added to sautés or böreks, and adds a very different flavor when added to bread dough. With it’s very thin leaves, it looks almost grass-like, and is just one of the tens of wild onion/garlic species growing in Turkey. There are two plants known as kenker in Bodrum. 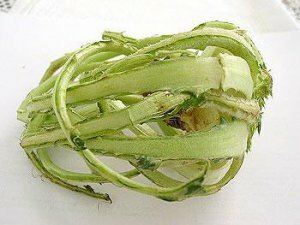 One, deli kenker (crazy kenker, Illyrian thistle) is used for dolma. It is also known as deve kenkeri (camel kenker) because camels love it. The other, uslu kenker (behaved kenker, yellow thistle) is also known as şevket-i bostan, especially in Izmir. 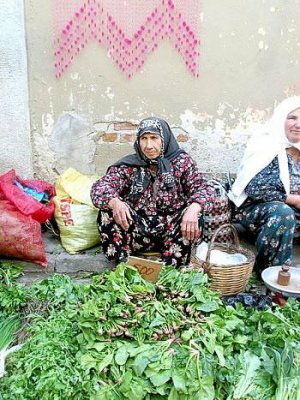 The women of Bodrum buy Illyrian thistle to make dolma at least twice during its season. Of course it takes some dexterity to remove the thorns and make thistle dolma, not everyone is up to it. But it is delicious. Illyrian thistle is also cooked with an egg lemon sauce, and it tastes something like a similar dish made from celeriac. There is a saying in Bodrum, “In a home where there is no meat, there is kenker,” implying that kenker is considered as nutritious as meat. The other kenker, yellow thistle, is usually cooked with chickpeas. Labada, or dock, is one of the plants used for dolma. 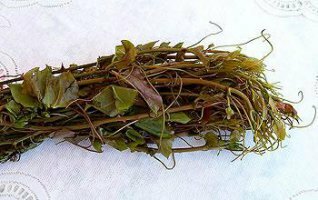 It can also be used in sautés, made into soup, or cooked like spinach. Although it is plentiful in fields and gardens, it is not one of the extremely popular greens among the people of Bodrum. İğnelik, or wild cranesbill (Geranium and Erodium spp) is an herb that makes its way into the markets from time to time, and is used in böreks and sautéed. It has an interesting aroma, one of those “love it or hate it” flavors. 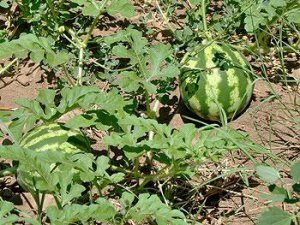 Those who aren’t so fond of its flavor cut it by adding it to mallow or nettles. It is suitable for böreks, made into a filling together with other greens or mixed with çökelek cheese. Kuşotu (chickweed), — grows everywhere. 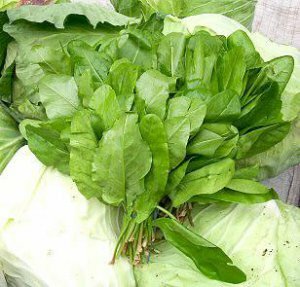 It is used both raw as a salad as well as in börek mixtures. If you don’t want to eat it raw, you can cook it with onions and tomatoes like spinach. Kuzu kulağı (sorrel, literally “lamb’s ear” in Turkish), with its tart flavor and finely shaped leaves, makes its appearance in spring. It is also a medicinal herb, and can be raised in the garden. But as our villagers are experts at finding it in the wild, they don’t see much need to cultivate it. It is generally found at the base of pine trees and in abandoned lots. I put it into salads, where it lends a pleasant tartness. It also makes a delicious soup that I love in the spring. Another plant known as sarmaşık, also known as bıyık, or “moustache,” is eaten raw. The broad leaves of this member of the bean family really do have a moustache on them. Looking at my list, I see two plants that haven’t much entered my kitchen. One is dağ marulu, or shepherd’s purse, and the other is acıot, black bryony. Acıot has just come onto the market and is quite expensive. There are also two subspecies of yellow wild chrysanthemum known as alegümeci and dallama. The edible portions are the thick stems and leaves. They are very popular among the people of Bodrum but I can’t say I’m particularly fond of them. They are boiled, drained, and eaten with olive oil and lemon juice. Those who like them say they stimulate the appetite. Alegümeci can also be cooked together with tomatoes; and that’s quite a delicious dish. So our chrysanthemum stems were waiting to be combined with another flavor in order to endear themselves to me. The warm spring weather is the blooming season for many of these herbs. The poppy opens its brilliant red flowers, the geranium and mallow blooms pink, alegümeci and dallama yellow, wild chicory blue, and wild radish and shepherds purse, white. At this point their leaves have toughened and they are no longer edible, and are replaced in the market by black bryony and wild asparagus. When the weather has warmed for good, the silcan (greenbriar, Smilax) shoots appear, and the samphire season begins, along with black nightshade. Towards summer, the wild purslane comes up in the fields, but the nettles are long past. The mallow has gone tough and the bryony is now in fruit with its brilliant red berries. As the summer vegetables come onto the market, we bid farewell to the wild herbs, until next fall, and in most kitchens, one more winter full of healthful wild greens has passed. The greens brought into the markets are a source of cash for the women who collect them, and cheap food for those who can’t afford meat. While some people make the traditional dishes and böreks of wild greens, others have created new dishes, and shared them with their friends. These are the wild greens that have graced my kitchen in one way or another. Some simply because I was curious about them or because they were rare; and others that I cooked nearly every week. Changing according to the season and the foods I wished to prepare, these herbs are the gifts of generous mother nature, that opened the doors to a new world for me. I could hardly imagine living without them. I hope that for you too, this information will open the doors to the mysterious world of herbs, and inspire your curiosity. Who knows, maybe we’ll run into each other in the market and talk greens, and share new flavors and recipes.